In 2003 I published a book about mercury poisoning from dental amalgam, fibromyalgia and the role in society of scientific research. It was built upon my own experiences as chronically ill, at that time it had been going on for 10 years. Unfortunately, my health has yet not improved, so today (2009) it's been 16 years. The print version is available in Swedish only, but there is now a version in English available on line as a 131 page PDF, with the title A Life Redirected: On Dental Amalgam, Fibromyalgia & Scientific Consensus. After the book was published, I also uploaded a few web pages with further comments on these topics, but only in Swedish. I believe, however, that especially one of those texts should reach also non-Swedish readers. I have therefore translated it into English – see below! It would be interesting to get in touch with other patients with the same symptoms or scientists studying this phenomenon. You may write to me at this e-mail address. In my book I mentioned an almost tragi-comically large number of symptoms and how they often change from day to day. Particularly, I emphasized two of them: muscle lumps (p. 24-25) and a sence of acidity and air in the stomach (p. 10, 37). This is worth repeating here. I am now even more convinced that they are important clues. The reason I use italics for the word 'feeling' is because I wish to emphasize that I am not always sure I really have a heightened level of acidity in my stomach. Very seldom do I get a reflux of gastric juice for example. But the subjective feeling of acidity is very real. The fact is that my whole body feels in a way sour, I may have a slightly sour taste in my mouth, etc. It is interesting to note that something as simple as Alka-Seltzers, i.e. sodium bicarbonate, can alleviate the symptoms a little, and sometimes significantly, when this acidity feeling/air production occurs. But in those cases, not only does the acidity get better, but the brain fog, twitching, dizziness do too, to varying degrees. At times, I have also taken Losecs, which also had some effect. I wonder of course what the acidity may be indicative of and how this can be as obvious a link directly to the brain. Since bicarb works, the question is how this effect is accomplished. Is the acidity connected with neurology in this case, so that when acidity is reduced, the neurological symptoms are as well? Or does sodium bicarbonate affect some other chemical process, e.g. in the endocrine system, or nerve cell signaling systems – no matter how acetous the stomach is? As I write on p. 24-25, it is difficult to figure out if the lumps of various sizes that I have in my muscles are the kind that in fibromyalgia are often referred to as tender points, or if they are rather what in myofascial pain syndrome etc. is usually called trigger points. Sometimes you may find these lumps described in the literature of German sports medicine as Myogelose, Muskelschwiele, Muskelhärte etc. I often get the feeling that sports medicine might teach also doctors treating pathological muscle conditions something. And maybe vice versa. Dysfunction usually says a lot about function. It is not crystal clear if Travell and Simons refer to lumps or more "flat" points, but still, this is also my experience. It is remarkable that doctors seldom seem to understand what this is. If one asks them to palpate, they find nothing – they probably do not know how to do it. You have to hold three fingers like a rake, pushing down on the muscle pretty hard and then slowly drag the hand along with the muscle fibres while maintaining the pressure. Then one may sense lumps and long hard tight bands. The smaller lumps are like rice grains or peas, and the largest like a grape or a small plum. But there are also hardenings shaped like thick "plates" inside the muscles (especially in the thighs), which may be around 1.5 x 3 inches, sometimes even longer. It would be interesting to hear if anyone reading this recognizes these symptoms. The drawings below show the various kinds of sore points, lumps and hard "plates" that I have in my muscles. The blue areas are tender lumps that sometimes can be removed by massage or static pressure. They always re-appear, however. Their exact position differs slightly from time to time, while the areas marked in red and green are in most cases located to the same spots also when they re-appear. On the brachia and up toward the shoulder-joints, as well as on the outer side of the thighs, there are rock-hard aching areas that feel as if there were plates under the skin, radiating pain (red marks). 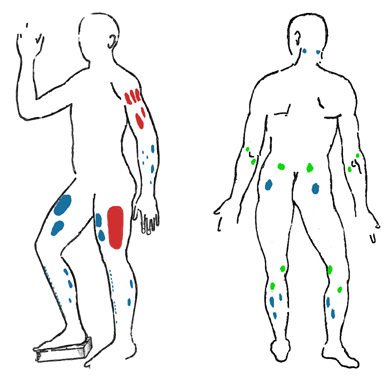 The blue areas are sore and aching lumps most consistent with text book descriptions. They can vary in size, some may be as large as plums, others like peas or rice grains (e.g. in the lower arm muscles and in the fibers adjacent to the shin-bones). The green areas are sometimes not lumps at all, but simply tender areas. Sometimes, rather than lumps they may even be experienced as cavities in the muscle tissue. These lumps and hardenings radiate pain – symmetrically around the spot, not like the referred pain of trigger points. Sometimes during infections this pain can increase to the unbearable. I have constantly a few lumps like these in most of my major muscles in my calves, thighs and lower and upper arms, and also a few in the nape of my neck. With great difficulty they may be massaged or pressed away with some kind of minute-long, static aku-pressure. But this is not possible to do with each and every lump – sometimes there can be 50 of them. The odd thing is that when I am feeling extremely bad and barely can walk or talk, even then, such symptoms (as well as brain-fog) may disappear to, say, 50 percent by this kind of massage or pressure. Not just the muscle pain itself is alleviated, but the neurological symptoms as well – almost as the mechanism described above with sodium bicarbonate (one wonders, of course, if the muscle lumps too are somehow linked to acidity). It is strange that this effect is so beneficial, since one otherwise hears that there may be toxins bound within a strained muscle and these substances would thus be released into the blood stream, making you feel worse. But this is not the case here. As for scientific articles about this phenomenon, there are a few concerned with pain-relief. They describe the lumps and how they may be injected with saline or even lidocain. Those articles, however, have not so much to say about the cause of these lumps. The following works have not really a proper etiology either, but they are still interesting, since they discuss causes and the biochemical nature of the lumps. From Max Lange's book. Click on image for more! 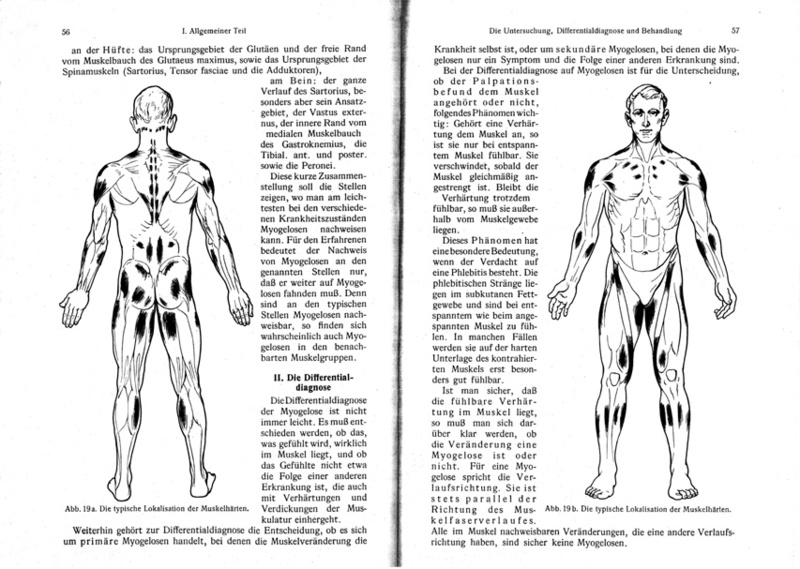 Lange describes various kinds of myogelosen, thereby also implying a little about causes. He distinguishes between four types of myogelosen, those caused by 1) cold, 2) infection, 3) overstrain or exhaustion, and 4) metabolic disturbances. Awad, EA, "Interstitial myofibrositis: hypothesis of the mechanism", Archives of physical medicine and rehabilitation, vol 54, Oct 1973, p. 449-453. If you have comments, please write to me at this e-mail address. Note: The above text will – as soon as my health allows – be continued with further descriptions of the findings of Max Lange and E A Awad.